Happy New Year! I can’t believe that time flies! I didn’t stuff myself with lots of food over Christmas and New Year, so, I am good … hehhe but I had too much of Champagne & Mojito! I’ve been bad on the food front, but have veen very good on the alcohol front! 😉 1 out of 2 isn’t bad I figure hehe. Made this pasta last night, it was delicious, very simple, the basil oil is maybe not needed but very good meal. Oh how funny! I don’t read her books so I didn’t know. 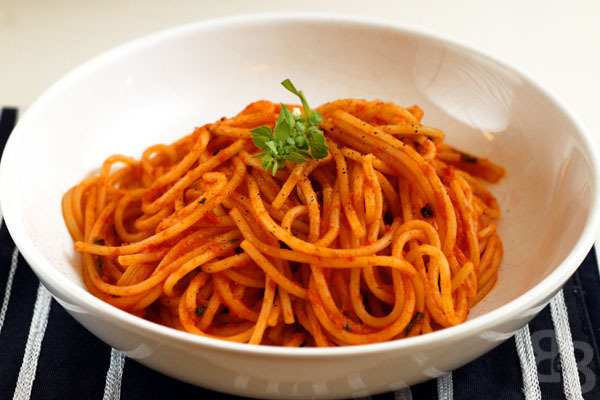 It is very tomatoey, a very nice “light” meal. I tweeted about this a while ago as I discovered that at the restaurant itself, they serve a small portion of this pasta for $24! I think you have at least $48 worth of spaghetti on that plate! Scarpetta is pretty awesome… now I want to go back. Ahhh someone who has tried their food! I will definitely try to go to Scarpetta when I’m in New York…. 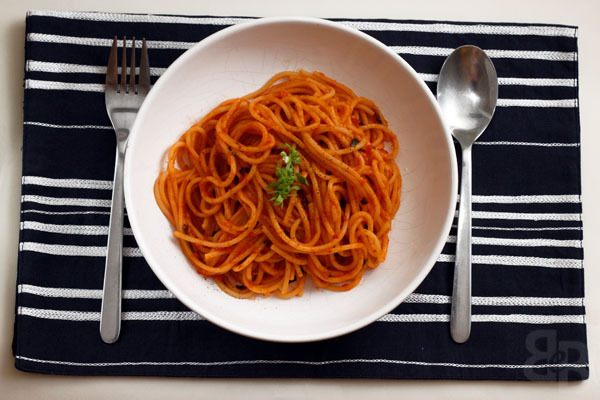 I’ve seen this on Jaden’ blog too a while ago and thought what’s all the hooha about, nothing more than just a simple reduced tomato sauce served with pasta but I reckon the basil-garlic infused oil would elevate the dish a lot. If you say it’s good, I might just have to try it….Can I ask how much oil did you use? I hate leftovers and feel like halving the recipe for the infused oil per recipe. 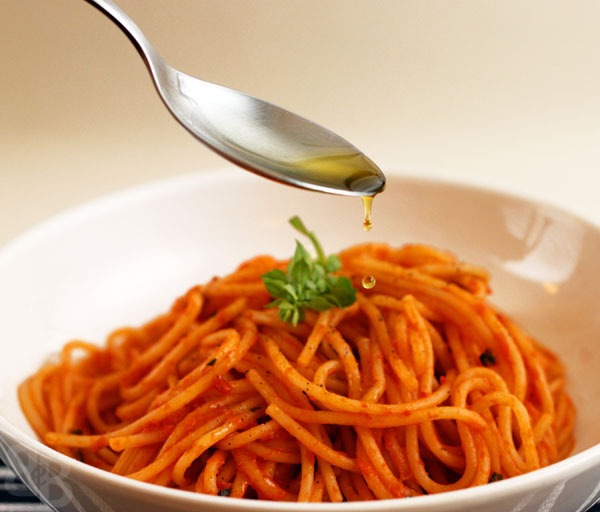 P/S: I am madly in love with the shot of you drizzling the oil, the molecule of oil droplets trickling down about to hit the pasta to create wonder, I am amazedddddd! Glad you like the photo, I just took loads and hoped for the best! Just wish the lighting was better (used a flash – in fact I use a flash for most of my photos… I miss shooting in daylight). You’re very welcome! The oil is brilliant, I didn’t use it for a salad but am sure it would work well. This looks so nice and simple and DELECTABLE. 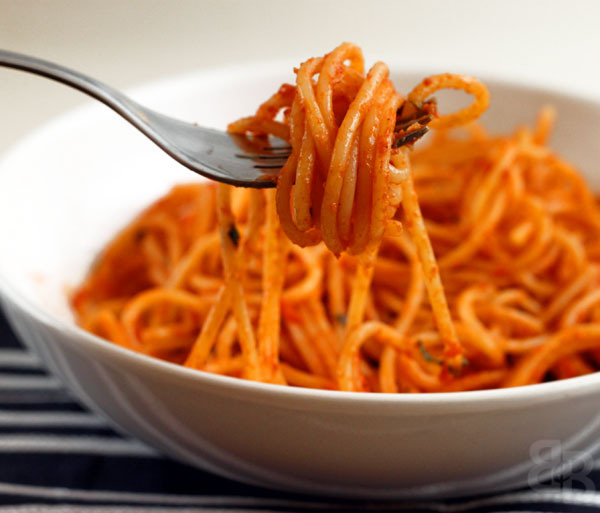 Living with a health freak, I dont ever get enough pasta and I would love a huge bowl of this right now!